Discussion in 'Lexus Lounge' started by krew, Sep 22, 2015. 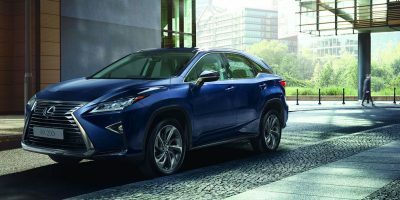 Australian website Car Advice spoke with Lexus RX chief engineer Takayuki Katsuda about the lack of a plug-in hybrid option for the new crossover. However, what if this cladding is hiding an alternative fuel option and Lexus is testing a fuel cell RX? This is pure speculation on my part, but there eventually has to be other models using the technology besides the Mirai. What’s your feeling on this? Should Lexus be looking at a plug-in hybrid or fuel cell version of the RX? I like the idea of a fuel-cell RX....that would give Lexus a significant marketing breakthrough. To my knowledge, it would be the first mass-produced fuel-cell SUV, though Mercedes, I believe, once did some prototype fuel-cell MLs. The biggest single obstacle to fuel-cell vehicles, of course, (though selling price can also be an issue, even apart from tax-breaks) is simply lack of a refueling infrastructure. Some parts of California have a reasonable network of compressed-hydrogen refill stations, but in most parts of the U.S., their construction and growth has been seriously neglected. The network is growing quite rapidly in the California hotspots where they expect people to drive the Mirai. I think the lack of any plug-in hybrid models is an embarrassment for Lexus. I recently test drove a BMW i3 and it was most impressive, making our CT 200h feel somewhat crude in comparison. So, a plug-in RX, or NX or CT would be appealing and help re-establish Lexus' innovative leadership. OK Mr. Anonymous tipster, will there be a LC F and a new IS F? plugin hybrids dont sell... mostly they are PR showpieces for media and then they dont offer them for sale in most countries... PHEV sales are constantly going down while EV sales are going up. Also, FCV RX at best would be for few countries as a showpiece for FC tech... it is not going to be real option for normal user for another decade. That's the point I was making earlier. Outside of a few areas in California, we've dragged our feet here in the U.S. developing compressed-hydrogen stations....and now, to get production of FCX vehicles going, we're going to have to play a major catch-up. With the oil price where it is now and looks like for the foreseeable future surely the pressure is off all manufacturers to worry about alternative motors e.g. Hybrid, fuel cell etc. Rather refine and improve the tried and trusted petrol engine. This may not appease the Green people but with the German disaster with diesel motors the motor industry I believe will take a deep breath and concentrate on continued refinement of what we know and trust. in many countries, fuel consumption is very important... only in USA, Russia and Arabian countries it is not.... so hybrids for instance are here to stay - Toyota produced 1.3m hybrids in 2014, and it is constantly growing. For 2016, they will likely go over 1.5m hybrids as they keep expanding models offered.... by 2020 Toyota will likely sell over 2m hybrids per year. it is a good start now... within 10 years, we should have reasonable infrastructure in western usa and parts of japan, europe and south korea. Gotta start somewhere!